After a sharp move higher in Treasury yields and some weakness in equities last week, Treasuries and stocks looked to settle in on Monday. NASDAQ actually looks to be trying to take on a bullish leadership role in recent sessions. Followers of both the NYSE and NASDAQ NH/NL ratios have been more accustomed to seeing the NASDAQ's NH/NL ratio indications reverse lower, then have the NYSE NH/NL ratios follow, but of late, the table has turned. Broader market breadth as depicted by StockCharts.com's NYSE Summation Ratio ($NYSI) that fell 44.02 today and remains in a column of "O" (decliners outnumbering advancers) to close at a measure of +403.33 today, and gives a "sell signal" at +420 suggests near-term internal damage has been done at big board. Tonight's closing measure violates the March'07 low a/d summation reading of 440 on a 20-point box chart. Investors and traders are welcome to visit StockCharts.com and view a point and figure chart. I've been updating this chart on a 20-point box chart. NASDAQ's Summation Ratio ($NASI) remains in a column of "X", but has started to slip with a closing measure of -31.01 at tonight's close. Earlier this month, this indicator of broader breadth at the NASDAQ reversed up from a -100 measure to reach +20 (envision 0.00 as a waterline), but would reverse back lower into a column of "O" and become more defensive once again with a -40 reading. Energy prices rebounded after Friday's sharp sell off that saw July Crude Oil (cl07n) fall 3.24% to settle at $64.75%. Today's rebound in July Crude ($+1.21, or +1.87%) to $65.97 may have been attributed to state-owned Saudi Arabian Oil Co., or Aramco, informing Asian and European consumers of Saudi oil to expect a cut of 9.5% to 10% in supply in July. Sector action had the Oil Service HOLDRs (AMEX:OIH) $169.90 +1.47% recouping the bulk of Thursday's declines, while the sometimes rate-sensitive Utilities HOLDRs (AMEX:UTH) $141.69 +1.09% may have seen some short-covering with the longest-dated 30-year yield ($TYX.X) holding near the 5.25% level, a level that currently marks the Fed's target on fed fund of 5.25%. The Utilities HOLDRs (UTH) have fallen 6.85% from their recent all-time closing high of $152.12 on May 21. Homebuilders as depicted by the Dow Jones Home Construction Index ($DJUSHB) are right back at their April and May option expiration lows of 600, where psychology of higher mortgage rates adds to lackluster commentary from sector CEO's. Late this evening, after the market closed, homebuilder Standard Pacific (NYSE:SPF) $19.88 -1.82% said cancellation rates for the first two months of its Q2 were up 28% vs. +35% a year ago. The builder cited continued weakness in Florida and Arizona, but said California bucked the trend, with new orders up 13% compared to a year ago. The company said California's cancellation rate was +29%, but down from the +42% last year. Bank of America's Daniel Oppenheim said he expects lower new home prices as expectations for cancellations worsen. Mr. Oppenheim thinks buyer will wait things out near-term, looking for another round of incentives/price cuts offered by builders. One stock that was on the move today, and atop the NYSE's list of most actives was telecom service provider Qwest Communications (NYSE:Q) $9.36 -7.96%. After closing above the $10 for the first time in 5-years, the company's CEO Richard Notebaert said he will leave the Denver-based telecommunications company. Mr. Notebaert did not give a specific timetable for his departure until the company's board selects a replacement. Mr. Notebaert has been credited with saving the telecom giant from bankruptcy amid a multibillion-dollar accounting scandal that saw shares of Qwest trade as low as $1.07 in 2002. There wasn't a lot of action in the S&P 500 Depository Receipts (AMEX:SPY) $151.30 +0.17% today, but last week's trade saw a hefty 779.7 million shares trade hand into this week's quarterly expiration. Seeing some further deterioration in the NYSE Summation ($NYSI) of late, and a NASDAQ Summation ($NASI) at roughly zero (O), I think bulls holding full positions should scale back to 1/2 position exposure. A quick glance at Dorsey/Wright and Associates S&P 500 Bullish % (BPSPX), which simply takes the 500 point and figure charts of those components, and stacks them into two piles (one pile contains charts that are on a "buy signal" and one pile those charts containing a "sell signal") shows a net loss of 4.61%, or 23 stocks to reversing lower point and figure sell signals. On June 1 and June 4, this important indicator of supply/demand was at 78.96% and still "bull confirmed," where a reversing lower measure of 72.00% would show some sign of supply outstripping demand with a "bull correction" reading. While overseas market action certainly seems to be "driving" some weakness here in the U.S. equity and Treasury markets, I want to put some things in perspective, as it relates to Treasury yields, mainly the benchmark 10-year Yield ($TNX.X). Still, per my Tuesday, 5/29/07 Market Wrap and SPY chart there, the SPY refuses to see a close below its 5/11/07 doji close of 5/11/07. Last week's decision by the European Central Bank to raise rates there to 4.0%, looks to have "accelerated" selling in the benchmark 10-year Treasury Yield ($TNX.X) last week. While the benchmark bond's yield had been creeping higher, last week's rise was rather sharp, up 25.8 basis points. I've said before that market participants get "jittery" anytime a currency, or a major bond makes a sharp and sudden move. Last week was no exception. But is the "jump" in the 10-year ($TNX.X) a sign of doom and gloom? As "smart" as I believe bond traders are, and the $TNX.X a reflection of that market, things seem to get out of skew from time to time. It amazes how quickly even the benchmark 10-year YIELD can move when it hits some point of "pain" for the wrong side of the trade, where a sudden group think sends YIELDS higher, or lower in quick fashion. From here, or current yield, traders and investors of bonds and equities will likely see shifts in their psychology. Should yield continue to rise toward 5.25%, which just so happens to be the Fed's current target on fed funds, I would think equity traders might play things a bit more "defensive," looking to see if another rapid move higher is in the making. The "big picture," which the WEEKLY interval chart allows, we can see the last time the Fed raised rates was back on 6/29/06. From there, the 10-year bond found strong buying, driving yield lower (for bonds, as prices RISE, yields DECLINE). One could say the bond market is probably getting back closer to where it "should be," given Fed commentary, and the current fed funds rate. Remember! When Treasury yields were FALLING, well below the current fed funds target, some were certain it was a signal from the bond market that the economy was slowing and had entered recession. And yes, this is where the banks, once again, become "key." It has been my long-held belief that the banks can be one of the best reads on the bond market and broader economy. Banks can RISE in price, even as Treasury YIELDS rise. Actually, since last summer, as Treasury YIELDs fell, a bank that lends money to consumers (business and individuals) like you and I, have probably seen their "gross margins" squeezed a bit. Many loans' interest rates are derived from Treasury bond yields, and as YIELDS fell, despite a fed funds rate of 5.25%, that "spread" narrowed. The other "variable," which makes the banking sector a pretty good read on the economy is this. HOW MUCH LOAN activity is there, even as a bank's margins improve? For the banks, it is a POSITIVE that they are now getting back some "margin" from higher YIELD in the bond market, but what, if any NEGATIVE impact will it have on the number of LOANS generated. I can sell one Mercedes Benz for $100,000, mark it up from my cost of $30,000 from the manufacturer, but if I only sell one at that HEFTY margin, can I really make any money and keep my dealership open? Selling 20,000 Mercedes with a $10,000 markup margin would be more profitable. The 10-week, or 50-day SMA (blue), the 30-week, or 150-day SMA (brown) and 40-week, or 200-day SMA (red) all converge at, or around the 400 level. You can feel the pressure building here. In October'05 as the 10-year Yield ($TNX.X) rose from 43.00, or 4.3%, the BIX.X was under selling pressure, and it Fed critics were roaring that the Fed would have to raise rates rapidly, mirroring the move in the 10-year at that time. The BIX.X reverses course from those October'05 lows and surged from 335 to 370, an incredible 10.5% in just six weeks as the 10-year yield ($TNX.X) rose from 4.3% to as high as 4.682% during the same time period. The BIX.X will likely be a "key" sector to monitor during the next couple of weeks. Fundamentals that are bullish for banks is that loan demand stay steady, as they get some "margin relief" from rising Treasury yields, which many loan interest rates are eventually derived. The bearish fundamentals, that haven't played out as witnessed by the technicals, is that the RISE in Treasury bonds, would be too great that LOAN DEMAND suffers significantly enough, that no matter how great the "margin relief," the loan demand works against that relief. Key levels look to be 390 support and 405 resistance. A break of that range will likely see the major indexes follow. The REIT sector is showing a lot of weakness so we're adding a couple of stocks from the group as shorts. AMB has developed a bearish pattern of lower highs and lower lows. Technicals are bearish and the P&F chart points to a $47 target. We are suggesting shorts with AMB under $58.00. The $56 level was support in the past so more conservative readers may want to wait for a decline under $56 before opening positions. There is some support near $54.35 but our target is the $52.00-50.00 range. We are fundamentally bullish on oil and oil service stocks. However, with BTJ, on a technical basis, this stock looks ready to crash. The rally ran out of steam in May and shares produced a bearish trend of lower highs from May to June. 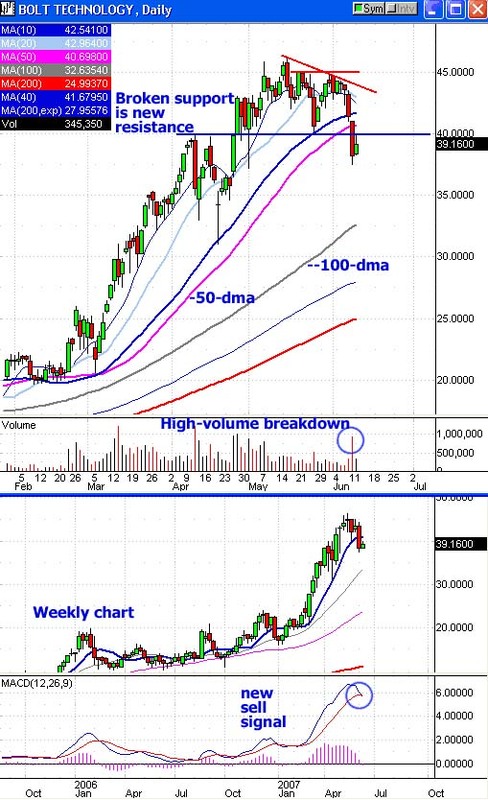 Last Friday saw a bearish, high-volume breakdown under support near $40 and its 50-dma. The oversold bounce today failed under the $40 level and that has produced a very attractive entry point for shorts. We are suggesting shorts with BTJ under $40.00. We'll use a stop loss at $42.01. More conservative traders may want to tighten their stop toward the $40 level. Our target is the $35.50-35.00 range. Aggressive traders could aim for the rising 100-dma near $32.50. The P&F chart points to a $31 target. FYI: It's very important that readers note BTJ's short interest is about 6% of the 4.9 million-share float. That's a relatively high amount of short interest and a VERY small float. Unfortunately, that could be a recipe for a big short squeeze and the small float might make it prone to manipulation. Trade carefully. A stop loss doesn't always save you. HCN is another bearish candidate in the REIT industry. 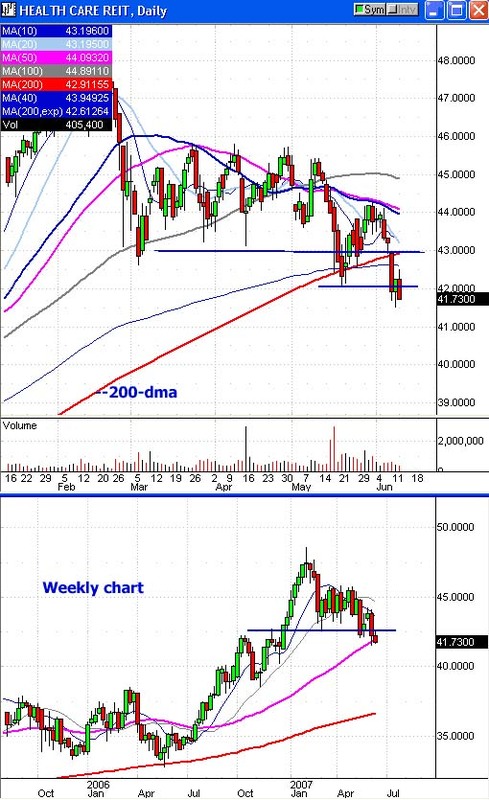 The stock has already broken down under technical support at the 200-dma earlier this month. Now shares are slipping back under support at the $42.00 level. Our one concern was the volume today, which was pretty low. However, HCN did not see any follow through on Friday's bounce and today's session looks like a bearish engulfing candlestick pattern. We're suggesting shorts with HCN under $42.00. There is potential support near $40.00 but our target is the $38.50-38.00 range. We'll use a stop loss above the 200-dma at $43.01 but more conservative traders could use a tighter stop above today's high. Be careful. APH did not see any follow through higher after Friday's rebound. That's a warning signal for the bulls. Readers may want to wait for a rise past $35.75 or our weekend suggestion that more conservative traders wait for a rise past $36.50 before opening positions. We'll try and limit our risk with a stop loss under Friday's low. Our target is the $39.75-40.00 range. It was a big day for ARA. The stock soared 3.8% and did so on big volume. Fueling the move was a 447-point rally in the Brazilian markets, which equals about +0.8% in the Bovespa index. Don't be surprised if ARA sees some profit taking tomorrow. Our target is the $68.00-70.00 range. We don't see any change in shares of CIT nor do we see any changes from our weekend comments. We are going to stick to our plan and wait for a breakout above resistance. Our suggested trigger to buy CIT is at $61.75. If triggered our target is the $67.00-70.00 range. Currently the Point & Figure chart forecasts an $84 target. More conservative traders may want to exit near $65.00, which could be round-number resistance. It looks like EMC tried to bounce but couldn't make it past the 10-dma. That's bearish for the stock and we would now expect another dip toward the $16.50 zone. More conservative traders may want to tighten their stops. Our target is the $18.50-20.00 range. Mexican stocks were also higher on Monday but we're a little disappointed that FMX didn't keep up more with the Mexican market's 1.1% move. More conservative traders may want to exit or tighten their stops. We're not suggesting new positions at this time but a move over $40 would be encouraging. Our target is the $44.00-45.00 range. KSU didn't move much on Monday although it does look like today's trading has produced a failed rally at the 10-dma, which is bearish. More conservative traders may want to tighten their stops toward $40.00. Our target is the $43.50-44.00 range. There is no change from our weekend comments on MGRC. We suspect the stock is poised for a breakout. We are suggesting a trigger to buy the stock at $32.31, which would be a new 52-week high. If triggered our target is the $36.00-37.50 range. The P&F chart is bullish with a $50.00 target. FYI: It's worth noting that MGRC only has a 23.4 million-share float and short interest is close to 7.5% of the float. A breakout to new highs could spark some short covering! Ouch! MU almost completely reversed Friday's gains with a 2.9% loss on Monday. This is definitely bearish and we're not suggesting new positions at this time. More conservative traders may want to exit now if they opened positions this morning. The lack of follow through higher after Friday's big bounce is bad news. Shares of RTN were slipping on Monday, down 1.3%, after a report came out that RTN's vehicle protection system was technically "immature" and needed significant development. Shares now appear to have produced a short-term top. More conservative traders may want to exit early. We're expecting a pull back toward support near $55.00. More conservative traders might want to consider a tighter stop closer to the $55.00 level. Our target is the $59.75-60.00 range. A rebound in crude oil contributed to a decent bounce in SM on Monday. However, the rally pared its gains after hitting the $38 level. We're optimistic but the move today almost looks bearish. Be careful about opening new positions here. Our target is the $43.50-44.00 range. WIRE displayed some relative strength but the rally failed again at the $30.00 level. More conservative traders might want to tighten their stops toward Friday's lows near $28.70 (or maybe $28.50). We would wait for a new breakout over $30.00 or over $30.45 before considering new positions. The Point & Figure chart suggests a $46 price target. We are targeting the $32.50-33.00 range. 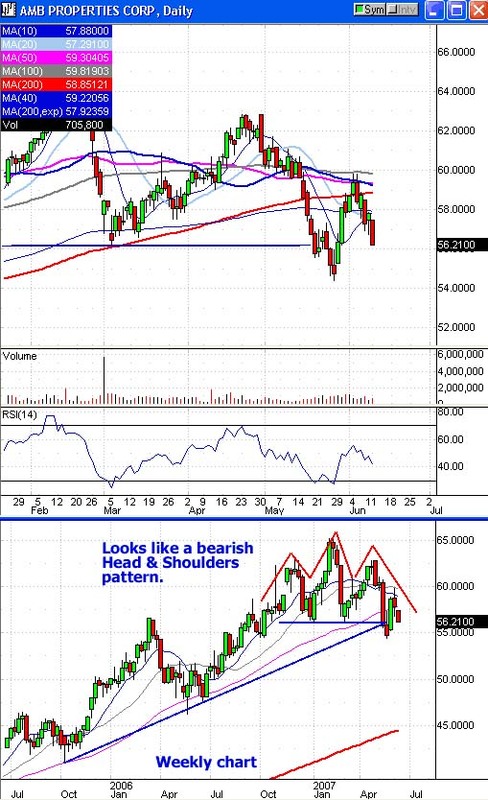 FLML produced a strong oversold bounce on Monday and closed up 3% but still off its best levels of the day. Wait for a new decline under $25.00 before considering new positions. Volume was pretty strong today, which should make bearish traders cautious. Our target is the $21.00-20.00 range. The P&F chart points to an $18 target but does show potential support near $23.00. SPLS failed near Friday's high. The lack of follow through on Friday's big bullish reversal is good news for the bears. This could be used as a new entry point for shorts or you could wait for a new relative low before opening positions. Ouch! Bears panicked on Monday after UBS upgraded shares of UST to a "buy" this morning. The stock spiked higher at the open and closed up 5.5% on big volume. This is bad news and while the stock is still under resistance at the $55.00 level more conservative traders may want to exit early. This is too bad. UST had been one of our relative weakness leaders to the downside. UST has already hit our target in the $52.60-52.50 range. Now we're aiming for the $50.50-50.00 zone. We are dropping PNK as a bullish candidate. 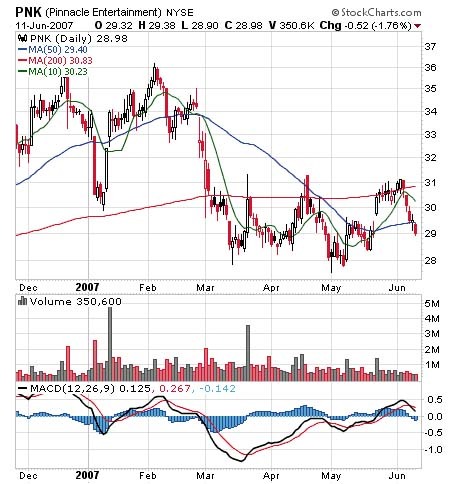 The stock continues to show relative weakness. Shares lost 1.7% and broke down under its 50-dma today. We had been waiting for a breakout over resistance near $31.00 with a trigger at $31.35 that hasn't been hit yet.